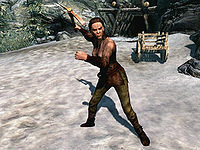 Resolve a feud in Dawnstar. The assassination of Beitild is part of the first batch of contracts handed to you by Nazir. After giving you the contract, he will readily tell you a bit about her background: "She separated from her husband several months ago. Now the two run competing mining operations. Beitild's angry and desperate. A fighter." In the town of Dawnstar it is common knowledge that Beitild and her ex-husband Leigelf are feuding, most evident by overhearing Leigelf arguing with the puzzled Lond in front of Quicksilver Mine and by talking to the participants themselves. Beitild now runs Iron-Breaker Mine, keeps a close eye on her workers at all times, and never misses the opportunity to bad-mouth the "fat-head owner" of the competing Quicksilver Mine. When you approach Beitild, you will be given three dialogue options, you can only pick one of them and will not be able to choose another one by trying to talk to her again. An alternative is to use stealth and kill Beitild in her sleep. She will return to her house at midnight and rest there until 8am. The lock on her front door can be picked or unlocked using the key she carries about her person. When Beitild is disposed of, you can pay a visit to her ex-husband for an emotionless reaction: "My wife Beitild is dead. Can't say I miss that old sabre cat." Return to Nazir in the sanctuary for a leveled gold reward. When you tell him Beitild is dead he will respond "Of course she is. I hear the mining business is extremely cutthroat. And those hours... they're murder." While this quest is active, it is impossible to turn in ore to the assassination target as only the three dialogue options mentioned above are available. If Silus Vesuius is on his porch and you kill Beitild while outside, Silus will become hostile even if you remained undetected. 200 Finishes quest Betild [sic] is dead, and I have collected my reward from Nazir at the Sanctuary. On the PC, it is possible to use the console to advance through the quest by entering setstage DBSideContract03 stage, where stage is the number of the stage you wish to complete. It is not possible to un-complete (i.e. go back) quest stages, but it is possible to clear all stages of the quest using resetquest DBSideContract03. This page was last modified on 19 November 2016, at 16:57.